UPDATED: Mon., Aug. 13, 2018, 10 p.m.
An abortion-rights group that has attacked the Trump administration for its “zero tolerance” immigration policies has set its sights on Rep. Cathy McMorris Rodgers with a new slate of ads appearing on local television. The ad buy is the first negative buy by an outside group in a contest that has already seen attack ads, and its message overlooks part of McMorris Rodgers’ legislative record to make the arguable point the congresswoman hasn’t done enough to combat family separation, which is widely unpopular in the district. Equity Forward produced the ad, titled “Thousands.” The claim ignores her vote for failed federal legislation that required detained children to be kept with their parents and her reported work on a bill that would have explicitly addressed family separations. A statement from the group, released with the ad, acknowledges this work. But the ad encourages constituents to contact the congresswoman’s office and tell her to take a tougher stand against the policy “to return all the children and hold the administration accountable,” using stock images and audio of minors detained at the border. “While McMorris Rodgers has said she’s opposed to the administration’s actions, she has not conducted any meaningful oversight of the crisis or held any administration officials accountable for their conduct,” Equity Forward said in a statement Friday. The group says it has purchased a “six figure TV ad buy” targeting McMorris Rodgers, which appears to be the first negative ads in the race for Congress between McMorris Rodgers and Brown not paid for by a candidate. 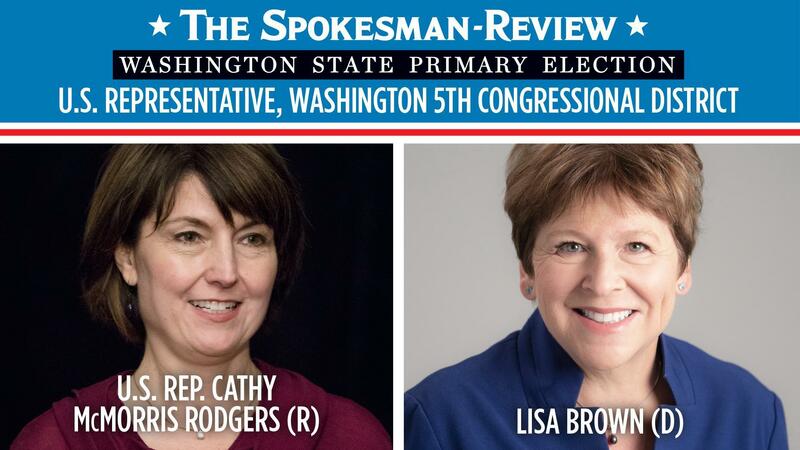 McMorris Rodgers has produced her own ads challenging Brown’s record on taxes and public safety that have raised eyebrows for lacking additional information about the former state legislator’s votes on the issues. Reports filed with the Federal Communications Commission through Monday show that the group has purchased about $63,000 worth of ads on local TV channels, with spots expected to begin airing this week. Jared Powell, a spokesman for McMorris Rodgers, pointed to her vote for the Border Security and Immigration Reform Act, a Republican piece of legislation that failed to make it out of the House of Representatives at the end of June, as evidence she was working to address the separation policy. That bill, in addition to requiring the Department of Health and Human Services to detain parents and children together, set aside $24 billion for construction of additional security along the southern border of the United States. Most of that ($16 billion) was earmarked for construction of a border wall, but the rest must be used for other facilities, including family residential centers. “She can’t unilaterally advance a piece of legislation into law,” Powell said. Democrats condemned the bill as calling for the continued and indeterminate detention of whole families. The bill failed to pass the House with just 121 lawmakers in favor; hawkish Republicans joined Democratic lawmakers to defeat the bill after a more conservative piece of legislation the congresswoman voted against earned a higher vote total, but also failed to pass. The congresswoman has also issued statements condemning the policy and talked to members of the administration about potential fixes, Powell said. In addition, the congresswoman was reported to have been working on legislation following the failure of a pair of immigration reform bills that addressed family separation alone. She confirmed the existence of the legislation to the national Congressional news outlet The Hill in late June, but that bill has not yet been introduced in the House of Representatives. McMorris Rodgers hasn’t been the only target of Equity Forward’s advertisements. A spot critical of Health and Human Services Secretary Alex Azar edited out contextual information from a quote given in a CNN interview, according to reporting from The Washington Post. The group also produced a poll before the primary election showing that a majority of likely voters in Eastern Washington thought the policy was inhumane and that Congress should act. The poll was conducted by the firm Global Strategy Group, which does polling work with the Democratic Party. Published: Aug. 13, 2018, 5:21 p.m. Updated: Aug. 13, 2018, 10 p.m.